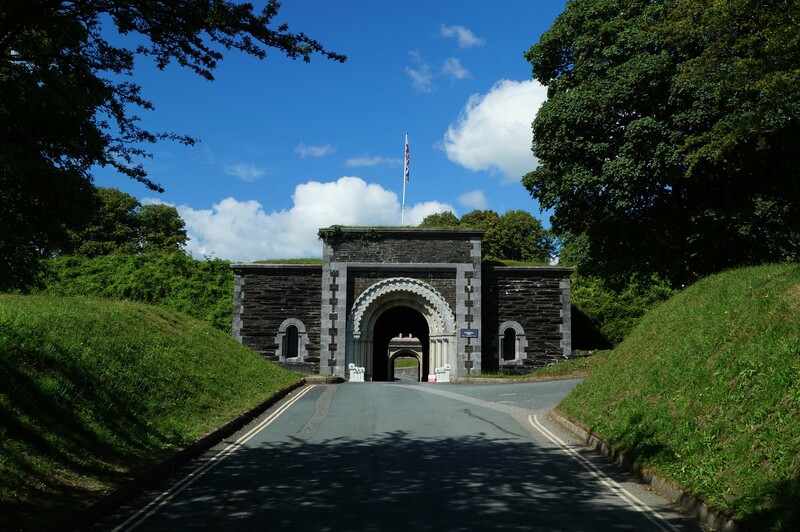 Crownhill Fort was built in response to French rearmament to protect the Royal Navy dockyard at Devonport and was one of a series of fortifications intended to stop an enemy force advancing from the north. Later it was used as a staging base during WWI, an anti-aircraft site in WWII and provided vital logistical support to the 1982 Falklands War. By the mid-nineteenth century a three decade long peace with France, coupled with a Royal Navy larger than the combined might of the next two biggest navies, had meant coastal defences around Britain had been neglected. However, this policy was thrown into turmoil with the accession of Napoleon III in 1852. The new emperor commenced an arms race with Britain by development of the first Ironclad warship ('La Gloire'; the Glory). This armoured vessel outclassed anything in the Royal Navy and threatened the country's maritime superiority. The British, whose prosperity depended upon the Royal Navy’s ability to protect both the homeland and the increasing number of colonies and possessions overseas, panicked. In 1859 a Royal Commission was initiated to investigate Britain's military readiness to counter an invasion. Consisting of six members of the Armed Forces, coupled with a Treasury representative, the Commission published their findings in February 1860 concluding that Britain's military forces were insufficient to guarantee an invasion attempt would fail. 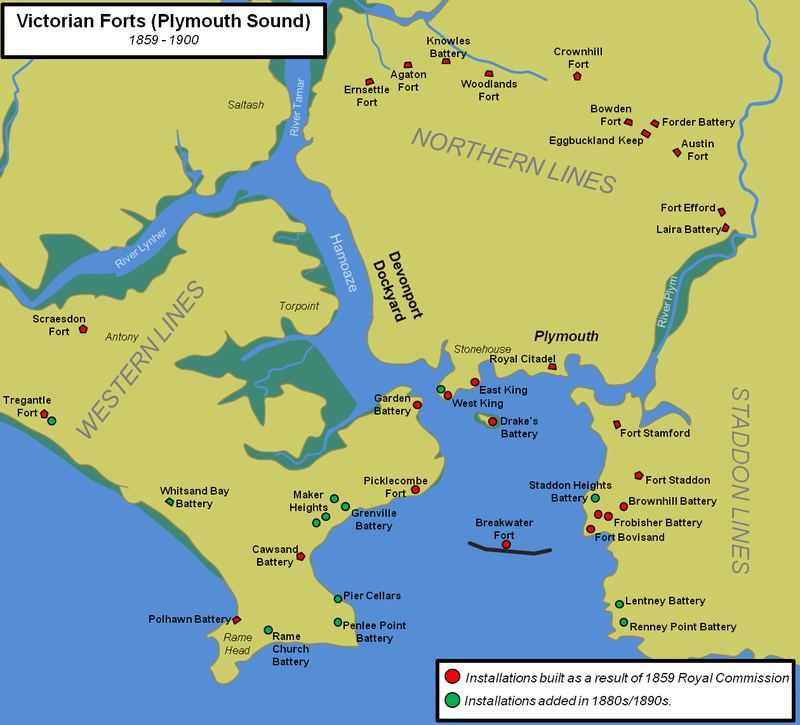 To mitigate, they recommended vital facilities across the coast - including the Royal dockyards at Chatham, Devonport, Portland, Portsmouth and Milford Haven - should be protected by rings of forts. The proposals were implemented by the Government of Lord Palmerston and represented the biggest peacetime military infrastructure project in British history. Crownhill Fort was one of the many fortifications built at this time. Work on Crownhill Fort started in 1862 with the structure being built on the summit of the ridge of high ground overlooking Plymouth. Work started under a private building contractor, Mr George Baker, but industrial action bankrupted him in 1866 and the Royal Engineers were required to complete the project. 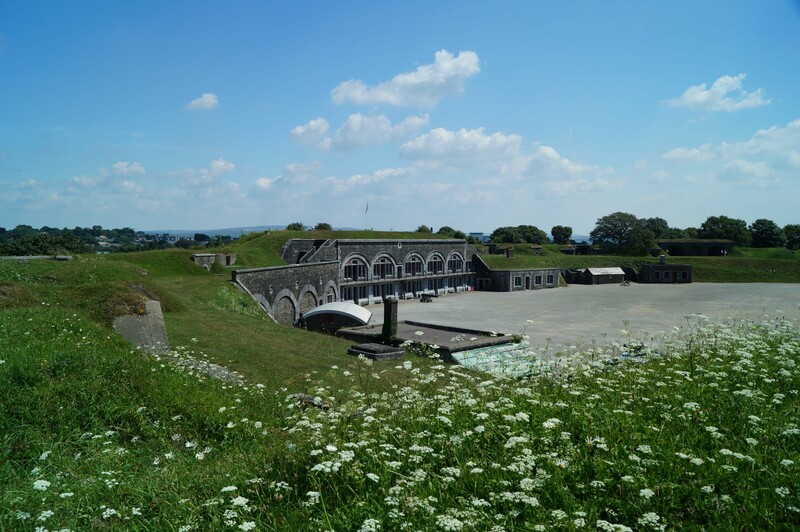 When Crownhill Fort was finished in 1869 it was the largest fortification in the Plymouth region and had cost around £76,000. It was the lynch-pin of the Northern Lines, a series of fortifications that extended across the neck of land that led to Plymouth Sound. Like the other forts in the chain, Crownhill was designed by Captain Edmund Du Cane and was configured in a polygonal shape. This was a marked departure from traditional fort design, which normally included bastions for self defence, but was based on the concept that the forts would act in unison to provide an unbroken wall of fire. Crownhill was positioned slightly to the north of the main line in an exposed position with its formidable fire-power designed to dominate the area. It was augmented on its west flank by Agaton Fort and Woodland Fort covering all approaches from Crownhill to the River Tamar. To the east Bowden Fort, Austin Fort and Efford Fort covered the approaches up to the River Plym. A military road plus a series of earthwork defences linked the northern forts. 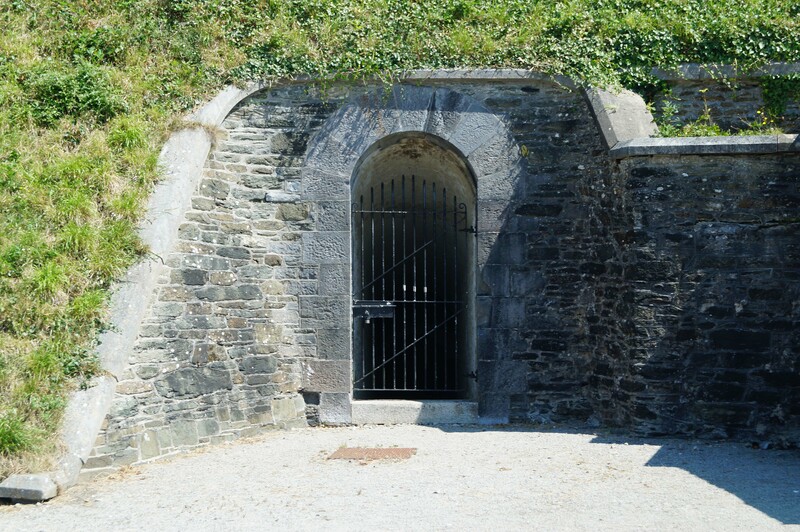 When it was initially constructed, Crownhill Fort's offensive weaponry consisted of 32 guns with 6 enclosed in casemates and the remainder installed on the ramparts. The defences included mortars and a ditch complete with Caponiers (sheltered gun positions that enabled defenders to fire upon enemies in the ditch). 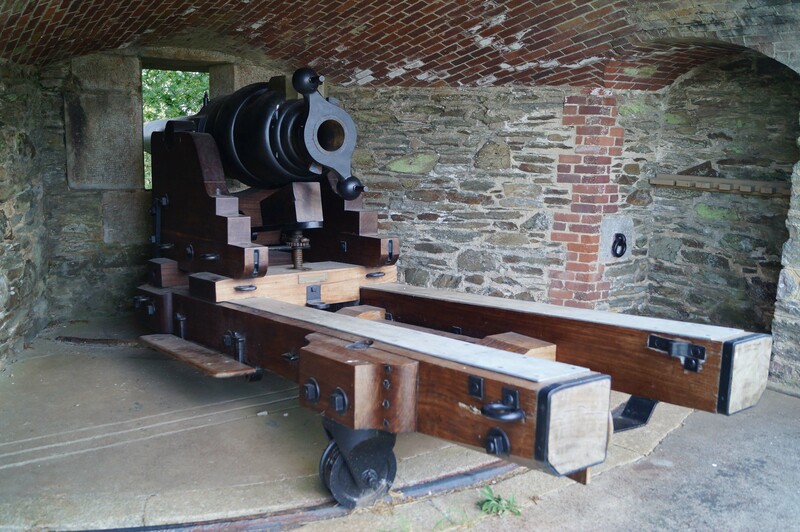 Upgrades to the armaments were made in the late nineteenth century and, unlike many of the forts, Crownhill was actually fully armed with its complete compliment of weapons. Although the danger from France quickly passed, the fort remained military property and during World War I was used a transit depot for soldiers en route to the Mediterranean. 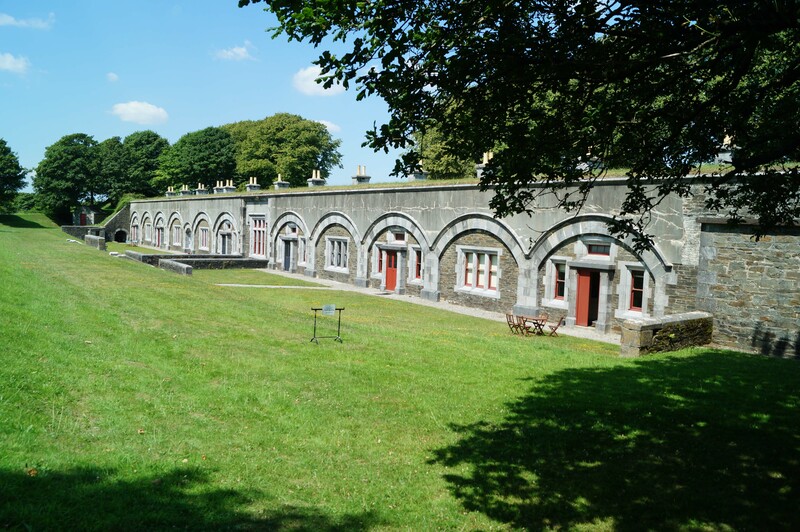 In the inter-wars years it was first a demobilisation centre and then became home to the Second Battalion of the Royal Devonshire Regiment. 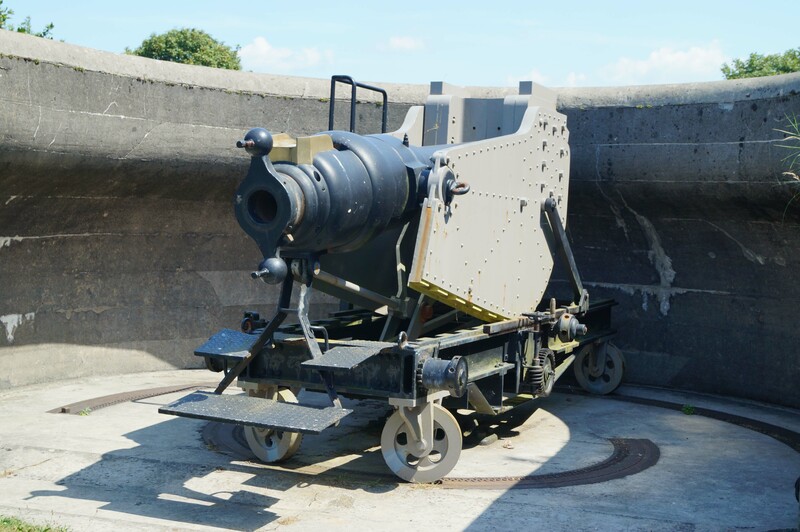 When World War II broke out the Crownhill Fort was hastily equipped with anti-aircraft guns as the existing magazines and facilities make it ideal for this purpose. After the war the site was used as the Headquarters of the Commando Support Squadron, Royal Engineers from where they provided significant logistical support for the 1982 Falkland's War. The fort was finally decommissioned in 1985 and purchased by the Landmark Trust. Historic England (2002). Crownhill Fort, List entry 1020571. Historic England, London. Crownhill Fort is the best preserved of all the Plymouth area Palmerston forts. 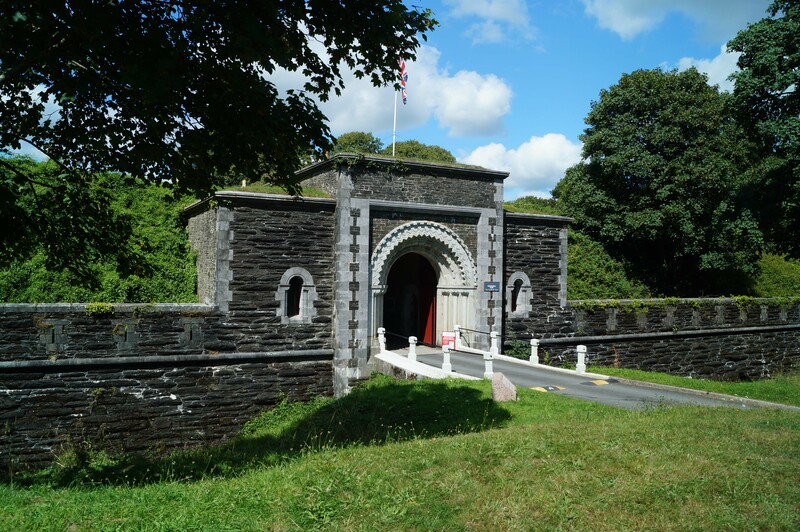 Although owned by the Landmark Trust, complicated insurance arrangements mean the fort is only occasionally open to the public so ensure you check opening times prior to visiting. However, the exterior of the fort can be viewed at any time via a public footpath that runs circles the site. Victorian Defences of Plymouth Sound. 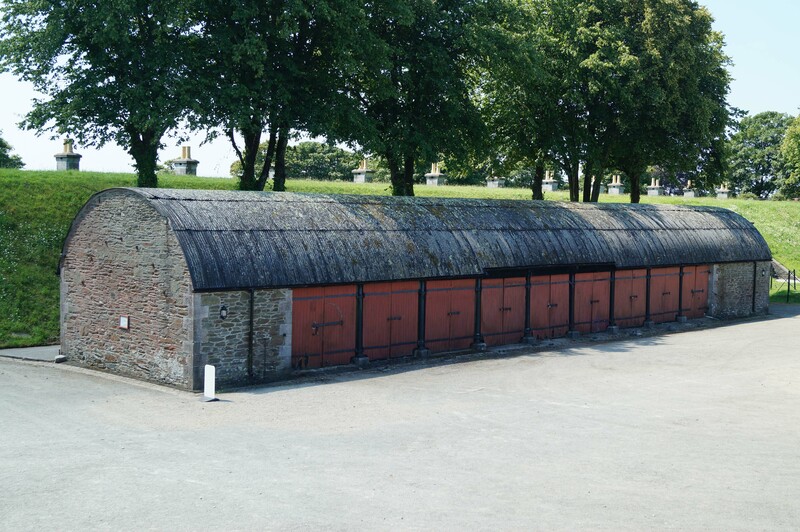 The Victorian defences were intended to ensure any enemy force was unable to close within artillery range of the important Royal Navy dockyard in Devonport. Crownhill was the lynch-pin of the Northern Lines, a series of fortifications spanning the neck of land between the Rivers Tamar and Plym. Additional forts provided protection from the east (Staddon Lines - centred on Fort Staddon), west (Western Lines - centred on Tregantle Fort) and also from a direct assault from the sea. Details of all the forts of Plymouth Sound can be found here. Gatehouse. The fort's gatehouse incorporated a guardhouse and cells. 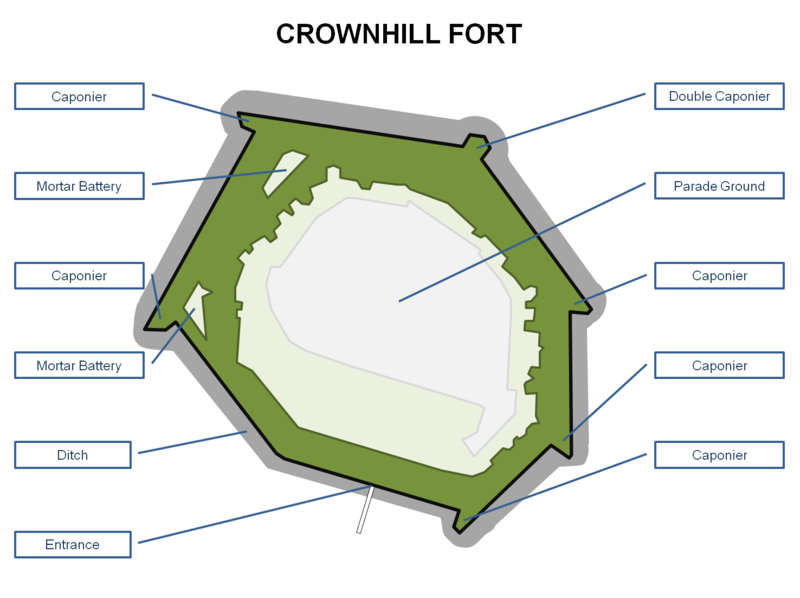 Crownhill Fort Layout. The fort was the largest on the Northern Lines and was positioned further ‘up threat’ than the others and accordingly was better defended. As can be seen above it was built with one double and five single Capioners plus dedicated mortar positions; all to protect against an infantry attack on the fort. Caponiers. Caponiers consisted of an extension of the fort into the ditch enabling flanking fire on any enemy force attempting to scale the walls. The picture above shows the south and south-east caponiers. Gun Positions. Crownhill Fort's offensive weaponry consisted of 32 guns. 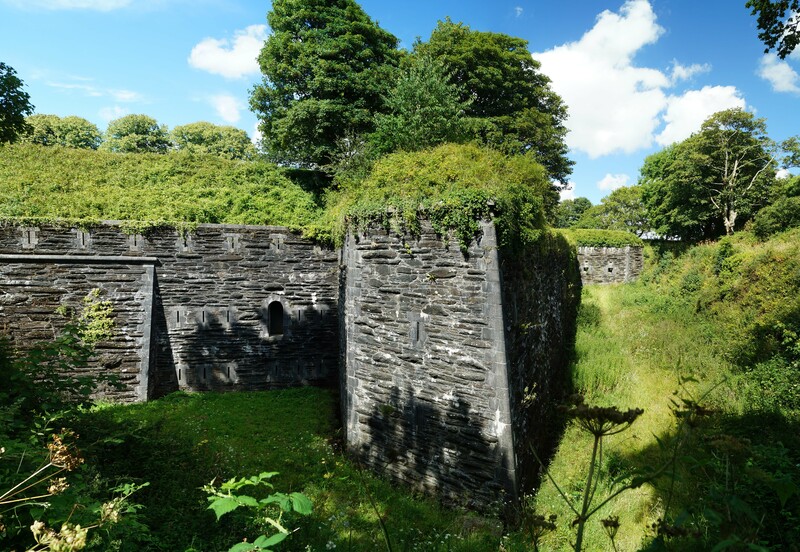 The bulk were installed on the ramparts (left) but six were enclosed within casemates (right). View from the fort's ramparts. Crownhill Fort is well sign-posted from the A38. When the fort is open to the public (normally one day per month, Summer only) there is dedicated car park within fort. Otherwise on-road parking is possible.